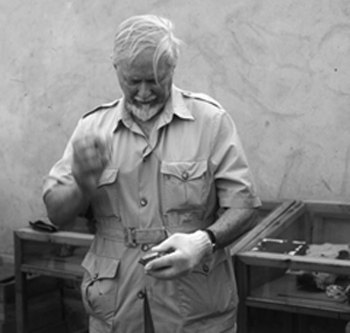 J. Desmond Clark, one of the early pioneers of systematic archaeological fieldwork in Africa, was a world authority on African prehistory and a preeminent figure in paleoanthropology during his incredible 65-year career. Desmond possessed a rare and incredible knowledge of African prehistory, equally profound in its breadth and its depth, which has never been, and likely never will be, equaled. UC Berkeley Professors J. Desmond Clark, F. Clark Howell and Glynn Isaac were the major mentors of Stone Age Institute Director’s, Kathy Schick and Nicholas Toth, during their graduate studies at Berkeley, and profoundly influenced their training and careers in paleoanthropology. Desmond honored us with the donation of his extensive library and artifact collections to the Stone Age Institute, which provide tremendous resources for ongoing and future research. After graduating from Cambridge University in 1937 at the age of 21, Desmond accepted a 3-year position as Curator of the David Livingstone Memorial Museum and Secretary of the Rhodes-Livingstone Institute in Zambia (then Northern Rhodesia). He confessed that at the time he had no special interest in the prehistory of that part of Africa, but there were no other archaeological jobs available right then, and so, with his mother’s encouraging advice, “It is only for three years, dear, and think of the experience,” he set off for Africa. This 3-year position eventually led to residing in Africa for nearly twenty-five years, and set him forth on his long and illustrious career investigating human prehistory on the African continent - so he never regretted his decision. He served as Curator, then Director, of the Museum from the time of his arrival in Livingstone in 1938 until 1961. In 1938 he married Betty Cable Baume, a fellow Cambridge University student. Betty became his close, lifelong working partner, assisting at the Museum, on field expeditions, and with publications and correspondence. During his years at the Livingstone Museum, Clark oversaw the construction of a new museum building and greatly expanded the staff and the scope of the museum’s research as well as its exhibits, library, and archaeological and ethnographic collections. This Museum was considered to be one of the finest in Africa, and, being a few miles from Victoria Falls, was a major destination for the general public and travelers as well as for scholars. In 1961 Desmond moved to the United States to accept a position as Professor of Anthropology at the University of California at Berkeley and became Curator of Palaeolithic Archaeology at the Lowie Museum of Anthropology there. 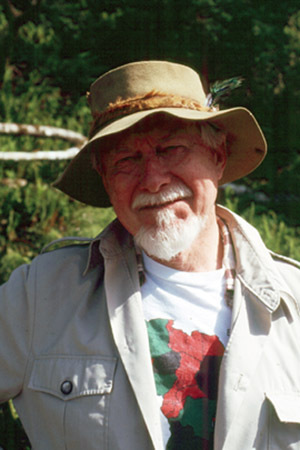 During his career at Berkeley, from the 1960’s through the mid-1980’s he helped to build one of the finest programs in African prehistory and human evolutionary studies. Close colleagues during that period included Ted McCown, Sherwood Washburn, Elizabeth Colson, F. Clark Howell, Glynn Isaac, Vince Sarich, and Tim White in anthropology; Garniss Curtiss and Richard Hay in geology; Roger Byrne in geography; George Dales in Near Eastern Studies; and Don Savage and Bill Clemens in paleontology. Desmond Clark and Glynn Isaac mentored dozens of graduate students in African prehistory and paleoanthropology from many countries, including the United States, Ethiopia, Kenya, Tanzania, Malawi, Zambia, Nigeria, Italy, Germany, India, China, South Korea, Japan, and New Zealand. He was especially proud of contributing to the training of students from developing countries in Africa, many of whom went on to play major roles in prehistoric studies in their native countries. Many of his graduate students are presently teaching or serving in museum or antiquities positions and conducting archaeological and paleoanthropological research around the world. He retired from teaching in 1986 and became Professor Emeritus at UC Berkeley, but retirement was not in his vocabulary or his nature. He energetically continued to do research, including fieldwork in China and Ethiopia, and to work on a myriad of publications and projects for fifteen more years right up to the time of his death in 2002 at the age of 85. The consummate field archaeologist, Clark conducted survey and excavation in a great many countries at sites spanning from the Early Stone Age through to the Iron Age. 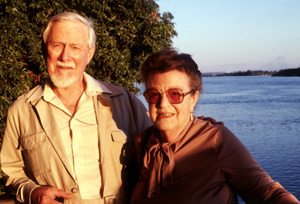 During World War II, he spent time in Somalia, Ethiopia, Madagascar, and Kenya, which allowed him to carry out considerable archaeological reconnaissance (much of it on foot) in the course of his war duties, and also to get well acquainted with Louis and Mary Leakey in Nairobi and to learn about their prehistoric research in Kenya and Tanzania. He received his Ph.D. from Cambridge University in 1951 on research that he had conducted before the war in the Zambezi Valley and that in the Horn of Africa during the war years. In Africa, he conducted research in Zambia, Malawi, South Africa, Somalia, Ethiopia, Angola, Tanzania, Niger, and Sudan. Outside of Africa, he worked in Syria, India, New Guinea and China. Among the major places that he excavated are the Zambezi Valley and Kalambo Falls in Zambia, Latamne in Syria, Adrar Bous in Niger, Gadeb and the Middle Awash in Ethiopia, the Middle Son Valley in India, and the Nihewan Basin in China. 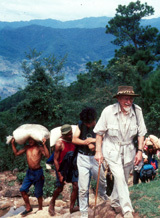 During the final decade of his field career, he co-led expeditions in the Middle Awash in Ethiopia and the Nihewan Basin, China. The Middle Awash research investigated an impressive record of Acheulean occupations and a number of important fossil hominids ranging from 4.4 million years to Middle Stone Age times. In a field project in the Nihewan Basin in China, Desmond, Nick Toth, and Kathy Schick conducted collaborative research with Chinese scientists investigating some of the earliest occupation sites in eastern Asia, dating to more than one million years ago. Desmond stressed actualistic studies, observations and experiments in modern settings to identify patterns to help in interpreting the prehistoric past. Many of his students have continued this actualistic tradition, conducting research in ethnoarchaeology, taphonomy, animal behavior, geology and site formation, and experiments in ancient technologies. Such approaches have allowed archaeologists to formulate more formal, testable hypotheses in their work, and greatly increased their interpretive powers by the latter half of the 20th Century. (In The Pastmasters, ed. by Daniel and Chippendale, Thames and Hudson). His publications include 18 books and over 300 papers, ranging from the detailed and specific monographs and reports to more wide-ranging syntheses and theoretical papers. Clark had an uncanny knack for seeing the forest as well as the trees, looking for the bigger picture of the prehistoric past as it is reconstructed from the minutiae of detailed, hard evidence, of which he possessed a vast knowledge. 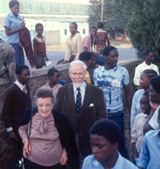 Desmond’s major books include Stone Age Cultures of Northern Rhodesia (1950); Prehistoric Cultures of the Horn of Africa (1954); Prehistoric Cultures of Northeast Angola and their Significance in Tropical Africa (1963); The Atlas of African Prehistory (1967); Kalambo Falls Prehistoric Site: Volume 1 (1969), Volume II (1974), and Volume III (2001); and The Prehistory of Africa (1970) (translated into Portuguese, Polish, Japanese, and Russian). Books that he edited or coedited include Background to Evolution in Africa (1967); Cambridge History of Africa, Volume 1: From the Earliest Times to ca. 500 B.C. (1982); Paleoenvironments and Prehistory in the Middle Son Valley, Madhya Pradesh, North Central India (1983); From Hunters to Farmers: The Causes and Consequences of Food Production in Africa (1984); and The Acheulean and the Plio-Pleistocene Deposits of the Middle Awash Valley, Ethiopia (2000). Among the awards and honors that Clark received in his long career are Fellow of the Society of Antiquities (1952), Commander of the Order of the British Empire (1960), Fellow of the British Academy (1961), Fellow of the American Academy of Arts and Sciences (1965), Commandeur de l’Ordre Nationale de Senegal (1967), the Huxley Medal of the Royal Anthropological Institute (1972), the Golden Mercury International Award (1982), the Gold Medal of the Society of Antiquaries (1985), election to the National Academy of Sciences (as a foreign associate in 1986, and as a full member in 1993 after receiving U.S. citizenship), the Leakey Prize from the L.S.B. Leakey Foundation (1996), and the Grahame Clark Medal for Prehistory from the British Academy (1997). antiquarian book dealers to order new acquisitions for his library on a wide range of subjects. He also loved to row, competing at Cambridge University and later at the Zambezi Boat Club. Desmond Clark’s students and colleagues will remember his fast-paced, fact-packed lectures; his equally fast-paced stride from the Berkeley Anthropology Department at Kroeber Hall up to his office on Piedmont Avenue; his stimulating and lively seminars at his home (often ending with sherry and cigars); and the great dinners that Betty would prepare for the frequent parties they hosted, sometimes a virtual “who’s who” of archaeology and paleoanthropology. Their cabin at Inverness overlooking the San Andreas Fault at Tomales Bay in northern California became for many years the destination for an annual pig roast cooked over an open fire. Their generous spirit of hospitality and joie de vivre were an inspiration to many of his friends and colleagues. Desmond was a relentless empiricist, searching for new data and information, but also a dedicated synthesizer, combining theory with hard data to improve our understanding of human prehistory. To the end he was also the genial and ever-enthusiastic colleague and friend, excited to hear about a new find or discovery, glad to meet new students and learn of their research, ready to discuss some fine point of archaeology, and always eager to welcome old friends, colleagues, and students and to hear news of their lives and careers. Overall, anthropology and prehistory truly had a great deal to learn from him, and his impact on prehistory and on those who knew him will be very long lasting indeed. Desmond’s generous contribution to the Stone Age Institute of his amazing library on prehistory and paleoanthropology and his artifact collections constitute a founding legacy donation to the Institute and provide invaluable support of its mission. So it is very fitting that, in memory of all that he did over his lifetime to improve our understanding of human prehistory, that we have named our Legacy Society in his honor. Kathy Schick's graduation from U.C. Berkeley's Ph.D. program. Nick, Kathy, and Desmond. Berkeley, California, 1984. Pan-African Congress field excursion. From left to right: Pierre Biberson, J. Desmond Clark, Thurston Shaw, Glynn Isaac, and Maxine Kleindienst. Dakar, Senegal, 1967. Desmond studying rock art at a rockshelter. Chencherere, Malawi, 1971. Desmond at a rockshelter. Malawi, 1972. Photo by Hiro Kurashina. Desmond on horseback. Gadeb, Ethiopia, 1976. Desmond and Betty at their cabin in Inverness, California, 1972.